Mmmmmm.....orange, citrus. My FAVORITE! I just received the Wild Orange Essential Oil from My natural family, like with all doTERRA products I have reviewed, I am in love. This smells so good I have worn it alone as perfume! Hey, I am Florida- smelling like an orange is how we ROLL! Okay, you might be wondering what this essential oil is good for other than smelling like an orange. Well....it is great for lots of things, including staving away colds and other winter time ailments. If you are looking for a natural way to prevent colds, diffusing Wild Orange in your home is a good start! Below is a list of uses taken from the My Natural Family Site. I find that when I wear this oil, I feel more positive throughout the day, and more energetic to get my tasks done. I particularly love to wear it to my job as a pediatric nurse. I generally do not wear perfume because the chemicals might bother the children with respiratory ailments, but have no problem wearing this all natural oil. Not only do I smell wonderful, but it helps me stay focused and on task throughout the day! We also diffuse this oil in our home. It leaves the house smelling fresh and clean and it helps keep the germs away from mybaby. He is 9 months old, and only recently had his first runny nose, and that lasted all of a day. I personally give credit to doTERRA! As always, you should take a look around My Natural Family for the best prices on doTERRA and also to enter a giveaway for the Wild Orange, which is their featured product of the month! 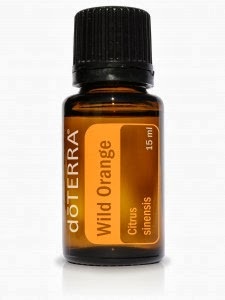 The Wild Orange is an extremely affordable oil and can be purchased for only $13.93. Win It: One lucky winner will received their own Wild Orange from doTERRA. Please use the rafflecopter form to enter! Contest open to US residents 18+, chances of winning depend on entries received, winner has 48hours to claim the prize or another winner will be chosen. One entry per household.